STAR R32 ensures a versatility level never reached before, offering at the same time high output and a good level of automation. 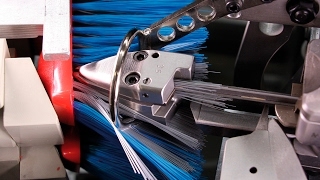 The variety of brushes that the machine can produce is wide and diversified, thanks to the 5 axes of movement run by brushless servomotors and the available range of specific tooling and accessories. The working cycle occurs simultaneously on 3 stations to guarantee high volume production. 3-stations-system: loading/unloading station, drilling station and filling station. Quick change-over time: the time required to switch from one setup to another is extremely low. 3-channels fiber stock box for the production of brushes with filaments of 3 different colors (optional). Matic system (optional): automatic feeding system and trimmer that make the STAR R32 a fully automatic machine.